Published in 1843, this is one of the earliest of Kierkegaard's major works. The author plays devil's advocate putting forward two opposing points of view challenging the reader to question the different alternatives. This book is written to provoke philosophical debate. Start reading Either/Or: A Fragment of Life (Penguin Classics) on your Kindle in under a minute. Kierkegaard (1813-55) was born in Copenhagen, the youngest of seven children. His childhood was unhappy, clouded by the religious fervour of his father, and the death of his mother, his sisters and two brothers. Educated at the School of Civic Virtue, he went on study theology, liberal arts and science at university, gaining a reputation for his academic brilliance and extravagant social life. He began to criticize Christianity, and in 1841 broke off his engagement to concentrate on his writing. Over the next ten years he produced a flood of works, in particular twelve major philosophical essays, many written under noms de plume. By the end of his life he had become an object of public ridicule, but he is now enjoying increasing acclaim.Alastair Hannay was educated at the Edinburgh Academy, the University of Edinburgh and University College London. In 1961 he became a resident of Norway and is now Emeritus Professor of Philosophy at the University of Oslo. Note: This review concerns the abridged Penguin paperback edition translated by Alastair Hannay. I think Either/Or has been misfiled in bookstores and libraries: This is a work of literature, not philosophy. Like all great literature (and music and paintings and sculpture) Either/Or is innately philosophical but it is written in a kind of lyric, poetical narration that sets it far away from, say, Hegel or Kant. It reads a lot more like a Platonic dialogue or a classical invective. Kierkegaard is both Proust and Aurelius; Either/Or is both A Search for Lost Time and The Meditations. The book is also very clever and variegated: It's at times cynical, at times sorrowful, at times nihilistic, at times optimistic, and very often it is comedic to the degree that I burst out laughing (we laugh because a mirror has been held up to our eyes). Either/Or seems to be a book about everything, like Burton's The Anatomy of Melancholy or Hugo's Les Miserables: it is what Allan Bloom would have called "a total book." Kierkegaard has a talent for packing the contents of ten books into the clause of a single sentence. And when he is not being utterly concise Kierkegaard can do as good a job as Proust in teasing a whole universe out of fleeting and otherwise commonplace moments: He can slow the camera down to a halt and, to borrow a modern simile, like Morpheus pausing the Agent Training simulation in "The Matrix", walk about the scene commenting with nuance, grace, and an often wholly refreshing acerbity. I promise you will be rereading and quoting paragraph after paragraph--it's that good. All Kierkegaard's more obscure allusions and metaphors are explained in a very complete notes section at the back of the book. To conclude: Either/Or is one of the best books I've ever read, full stop. *Prometheus was tied to the side of a cliff and had his liver eaten every day; Tantalus was doomed to stand in a pool just out of reach of both water and food; Sisyphus was made to roll a boulder up a hill every day only to have it kicked back down the hill once it reached the top. Those Greeks sure knew how to punish didn't they? 5.0 out of 5 starsBe aware that this edition is abridged. I didn't realize it was abridged when I bought it. However the reason I bought this edition was to have it all in a single copy, so I did get what I ordered. Some 'Diapsalmata' were removed from part one. I enjoyed these passages and was slightly disappointed by this. One essay from part one is missing, as are later passages that make reference to it ('First Love, Comedy in One Act by Scribe, translated by J.L. Heiberg'). Other passages are truncated in various places, which hasn't bothered me so far (most omissions are in part two, and I haven't gotten there yet). I also suspect that combining the two parts into one volume also forced the translator to keep his annotations brief. This review is of the Kindle version of the Hannay translation of Either/Or, a pioneering work of phenomenology and religious existentialism. It appears that the full edition (Hong translation)is about 800 pages (the main text) whereas the Hannay is about 600 pages. Even this abridged version was extremely taxing and took an enormous amount of time and concentration. For example, readers need to have at least - or quickly acquire! - the necessary background, such as the aesthetic theories of Aristotle and Hegel, Antigone and other Greek tragedies, the ethical theories of Kant and Descartes philosophy. Without these and others, which Kierkegaard doesn't always identify I certainly, and I'm sure others, would be unable to follow what's going on. I have found Stephen Evans introduction to Kierkegaard useful to this difficult work. I think a somewhat more expanded explanatory notes would have been useful. Part II has an entire section which appears to be a commentary on Kantian ethics without mentioning any sources so some more help would have guided the reader better, without having to go to the secondary literature. The Kindle table of contents had a few bad links but generally no problems. A word about reading a difficult "philosophical" text on Kindle. This was one the first times I tried it. For me, in retrospect, the costs outweighed the benefits. Unlike a work of fiction or an easier work which can be read more or less straight through, I found that a work that requires going back to previous sections and comparing passages and so on, difficult on kindle. Dude this book is awesome. "Either" is an easy fun read. "Or" is a little tougher but will give you a lot to think about. 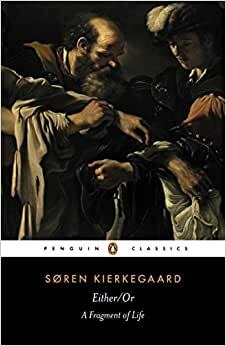 Even though Kierkegaard wrote this so long ago, it's the most relatable philosophical book I've ever read! He's like eloquently describing things that I've experienced but never was able to understand or put into words. Real good! Read this! I should have known what I was buying and that is my mistake for not seeking out the proper edition but this was a huge disappointment recieving the book to find out it was abridged. At the time of writing, there is no mention of abridgement on the Amazon page.